We all know every component of a window is encapsulated within a frame. Choosing frame is based on different factors. A well-crafted frame is quite much dependent on the raw materials used in its making. If you look at homes in Pakistan, you’ll get to see a wide variety of window materials. Some houses have wood, aluminium, fiberglass windows whereas other features iron. To make your home windows lifelong, it is really important to keep in mind pros and cons of different window frames. In this article, expert Lahore architects will explain to you four different types of window frames produced in Pakistan and how each of them is good. Metal is the strongest of all materials, there’s no doubt about it, however, it has its downsides too. The iron frames are prone to rust which is why they require regular maintenance. If you live in an area where there’s plenty of rain throughout the year, you may need to get your iron windows repainted every three or six months. In regular cases, getting them repainted by a professional becomes mandatory at-least once in every year. The iron frames are quite popular across Pakistan as they don’t get affected by termite and other insects. The wood frames are used in high-end homes across Pakistan. They are not just costlier than the iron window frames but also require a lot of maintenance. The wood frames are prone to termite, which is why they need regular maintenance. Their polish gets faded out every three months if they have regular sun and rain exposure. This bounds homeowners to get them re-polished quite often during the year. For the window frames that are painted with enamel, you need to refresh the paint every six months. 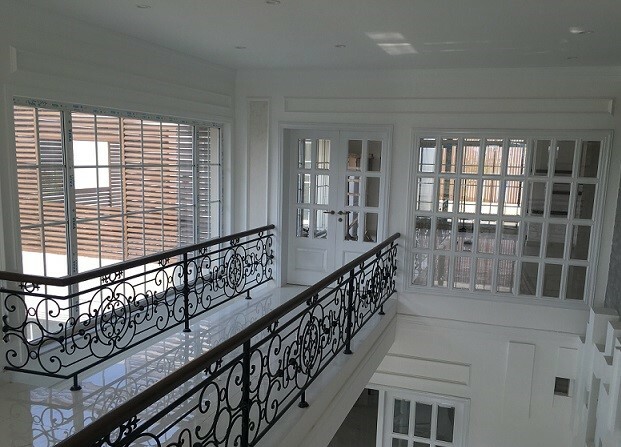 In spite of its shortcomings, the wood frames give an extremely elegant and stylish look to any home and are a symbol of luxury when it comes to home windows. The fiberglass window frames have seen steady growth in popularity over the recent years, not just in Pakistan but all across the world. They are considered as a low-maintenance alternative to the traditional wood frames and help to enhance the curb appeal through their aesthetic flexibility to match the house’s architectural style. The fiberglass window frames have gained popularity because of requiring minimum maintenance and due to their long-lasting nature. The aluminium window frames are lightweight and extremely long-lasting. They are in fact popular because of their slim profile, durability, narrow sight lines and low maintenance. The aluminium windows can be configured into a variety of combinations. The aluminium window frames are available across Pakistan in anodized or baked-on finishes that ensure lifelong color. As compared to the vinyl, fiberglass, iron and wood frames, the aluminium conducts heat and cold the least well. A professional construction company in Lahore would suggest you install thermally improved aluminium frames.